I started this year with only 10 months sewing under my belt: an eager novice, with much to learn. I took myself off on some experiments with seams and hems. I researched, sampled, photographed and documented. I discovered beauty can really can be on the inside (unless my hand sewing is involved ... in which case ... quick, look away now). I'd like to do more of this next year. More hems and perhaps some closures. In the meantime, its all French seams and Hong Kong finishes for me. And none of it by hand. Hope you have a wonderful new year Liesl. 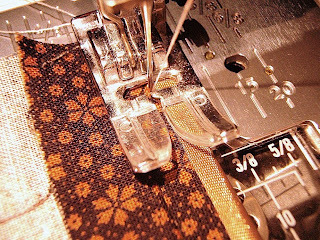 I'm always impressed at your amazing talents for researching proper sewing techniques. I need to learn as much as I can! Wow. Is that how long you have been sewing? I had no idea. Hong Kong seams are on my agenda for my 1st project of 2010...now I just need to find out what they are! 10 months? Wow! I'm impressed with all the progress you made this year! You are my hero. I have been wanting to learn to sew for a few years now, but have not been able to work up the courage. Reading about what you have achieved in your short sewing career has made me determined that 2010 will be the year for me. I will definitely be going back to your seam-alongs and hem-alongs one day soon.